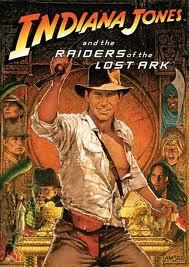 Raiders of the Lost Ark (1981) Sometimes it is only with the help of a great film critic that I can really see a film. I have loved this film since the first time I saw it, sitting in a movie theater in the Loop in Chicago. I was aware of loving the whiz-bang, thrill-a-minute ride. I loved the characters, and I loved the fun of it. But I could not say why it was a film I was happy to see again and again. It’s just now, after reading Roger Ebert’s “Great Movies” review, that I realized this film had been singing to my Jewish soul. OK, enough of me stealing from Roger Ebert. Click the link to his review. Read it. He does a wonderful job of unpacking the reasons that this is a film with genuine Jewish content stuffed into every crevice of a crackerjack fun ride. Serious Holocaust education is important and vital if we are not to forget. However, anyone who has actually sat through all 9 1/2 hours of Shoah will tell you that getting a Holocaust education is heart-breaking and soul-wrenching. If, after you have done your serious study, you find that you need an antidote, something to lift the heart a bit, Raiders of the Lost Ark might be just the ticket. This entry was posted in United States and tagged Anti-Semitism, Holocaust, Suspense. Bookmark the permalink. Great comments; and thanks for pointing out Ebert’s great review. I had very much the same reaction you did. It was one of my favorite movies as a teenager, but at the time I was unaware of the subtle religious themes inside Spielberg. Looking back now, with hindsight, it’s easy to see how a young adult’s anti-Nazi fantasy eventually grows into an extremely serious “Schindler’s List,” which is now one of my favorite films, as an adult. I disagree with this review. I find the film to reflect a profound anti-semetism. No Jews are involved for the search for the Ark. An arab and a number of gentiles are though. No thought whatsoever is given to the Ark being returned to the Jews. Jews in this film simply don’t count. The Jews don’t exist in this film. The Jewish God is prepared to manifest Himself in history by destroying a handful of German soldiers for disturbing the Ark, but isn’t prepared to do a thing when the living, breathing Ark of the Covenant, the people of Israel, are shipped to the gas chambers by the Germans. In this film, the Jewish God cares about a box, but doesn’t care about His people. There’s a word for that. The word is “blasphemy”. At the end of the film, the Ark then is packed up in a crate and packed off by an old man into a warehouse full of junk being stored by the US Army. Somehow it’s OK for the US Army to keep the Ark in a warehouse full of junk? The only debate is whether the gentile “expert” gets to “study” it. No debate takes place as to whether somehow even maybe the Jews should have anything to do with the Ark. Well why should they? In this film Jews don’t exist. The Jews don’t count. No. This film depicts a deep and fundamentally anti-semitic world-view. Wow! Thank you for the careful analysis – you’ve made some excellent points. Contemporary Jews are invisible in the film – completely invisible, which is interesting given that the writer and the filmmaker is a Jew. Thanks so much for your comment, and for the passion and thought behind it. I wish these commentaries got more of this sort of vigorous debate! With due respect, I think A Israel is wrong to call this film anti-Semitic. Although none of the characters are Jewish, Jewish history is celebrated and Nazis, enemies of the Jews, are vilified and eventually destroyed by the Jewish God. Jewish presence in this film is much more subtle than some contemporary films, but “Raiders of the Lost Ark” was intended to be matinee action, not a serious examination of Jewish religion and society in the 1930s. And to call out the Jewish God, in this film, for not saving His people from the Holocaust is way out of line, especially considering that the film is set in 1936, two full years before Kristallnacht. Many great theologians have pondered long and hard about why God remained silent for so long during the Holocaust, but this film is not at all an attempt to deal with that question. The God of this film doesn’t return the Ark to the Jewish people for a number of reasons, not the least of which is that it would not be historically accurate. Neither, in 1936, is there a Jewish state nor a rebuilt Temple in which to place it. I think it’s fair to assume that God wants to keep the Ark hidden. If it cannot be hidden in a buried Egyptian city, then it can be lost and forgotten amidst a huge pile of government bureaucracy deep inside a giant warehouse. The Jewish people may not get the Ark, but neither is God prepared to let it be examined by academics either. It may be fun to speculate as to God’s reasons. Perhaps He feels the Jewish people are not yet ready for the Ark. Perhaps He feels that the religion has evolved beyond the point where the people need an Ark. But these interesting religious issues are beyond the scope of the film which was really just intended to be a fun ride with a slight nod to Jewish history. I find that more than satisfactory. Ebert’s review suggests that the Jones character is the fantasy of a Jewish boy. We might explain the apparent absence of Jews by postulating that all the good guys are secular and/or hidden Jews.